Raise your hand if you like doing the dishes???? Um . . . If anyone is actually raising their hand, please come to my house and you can be my new bestie! 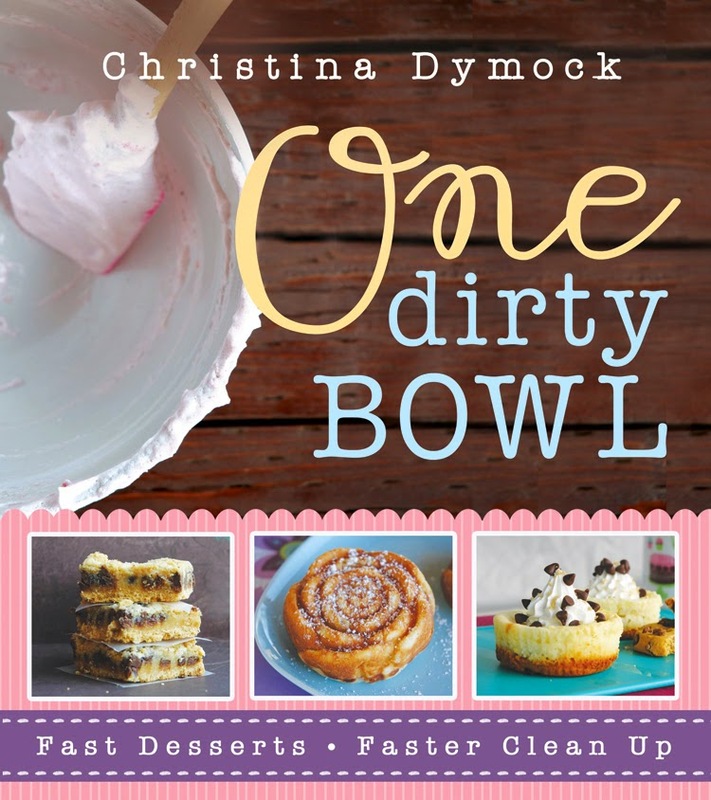 If you like making dessert, but you aren't a fan of dirty dishes, then this book is for you. I tried the S'mores Bars. Then, I found out today is National S'mores Day. Perfect timing! The base is made from store-bought sugar cookies and then covered with a variety of candy bars and topped off with some marshmallows. There are only a few ingredients and it only dirtied one dish. I believe the assorted miniature candy bars she is calling for in the recipe are the pack with Mr. Goodbar and Krackle? I wanted to use some of my favorite candy bars instead. These bars would be perfect to make after Halloween when you have a ton of candy bars lying around. They are ooey-gooey and delicious. Since all of the ingredients being used are very rich, a small bar is plenty. There is a reason she cuts the bars into 16. I cut mine into 9 bars and they were a little too big to eat an entire bar, since they are so rich. Overall, I like this book. Some of the ingredients and recipes are a little vague. I could see a beginner baker questioning a few things. Like, some of the recipes just call for frosting and then others say 1 (12 oz.) tub of frosting or store-bought frosting? So, when it doesn't list a tub of frosting or store-bought frosting, do we make our own? Also, I saw caramel frosting, marshmallow and maple frosting in the book? Can you buy those flavors or should we add flavoring to vanilla to make it those flavors? There are no frosting recipes in the book and since I am the BIGGEST Frosting Lover EVER, I was kind of hoping for a few new recipes, but I guess that is how you only dirty one bowl. You have to mix from scratch ingredients with store-bought ingredients. BUT . . . with all that said, the recipes really DO sound fantastic and I think you and your family will enjoy them. There are a variety of desserts from cakes and cookies to bars and quick-bread and even cobblers and pies. There are some classics as well as some new recipes that I have never seen or heard of. Plus, there are quite a few pictures. Preheat oven to 350 degrees. Spray an 8x8-inch baking dish with cooking spray and line with parchment paper with a slight overhang (to help easily remove the bars for cutting). Place the cookie dough, as a block, into the baking dish. It won't fill the whole pan, but will spread out as it bakes. Bake for about 30 minutes or until the edges are lightly browned and the center is almost set. Remove pan from oven and top with candy bars, covering every last bit of the cookie crust. 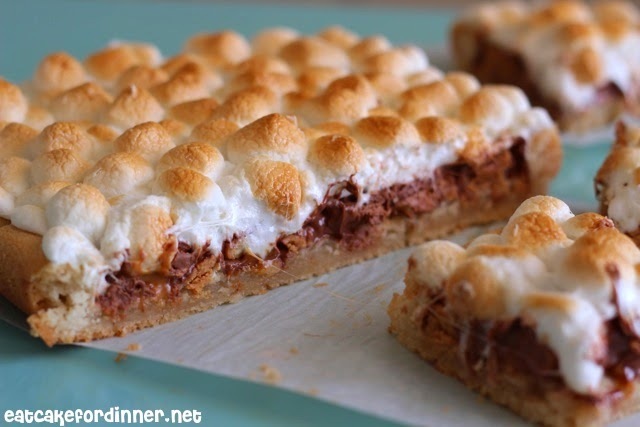 Top chocolate layer with marshmallows. Return to oven and broil on low for 3-5 minutes or until the marshmallows are lightly toasted. Remove from oven and allow to cool for at least 20 minutes before serving (I let mine cool for about an hour and they were still extra ooey gooey). Linked up at Time to Sparkle! Wow! 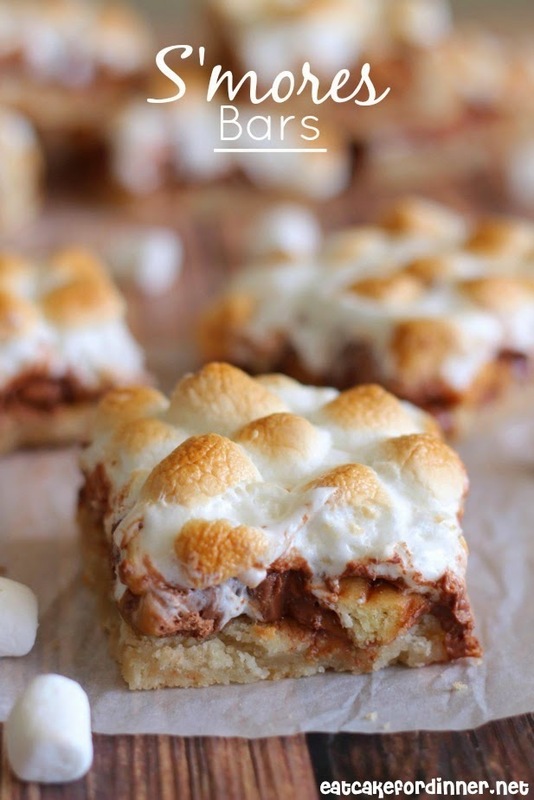 These smores bars are to die for! 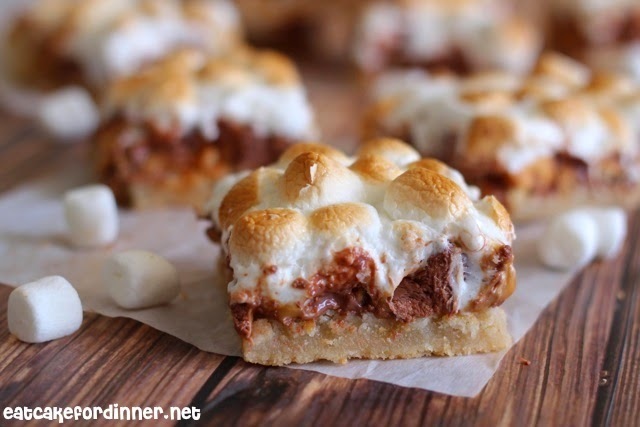 I love how you can brown the marshmallows in the oven! Yum yum. 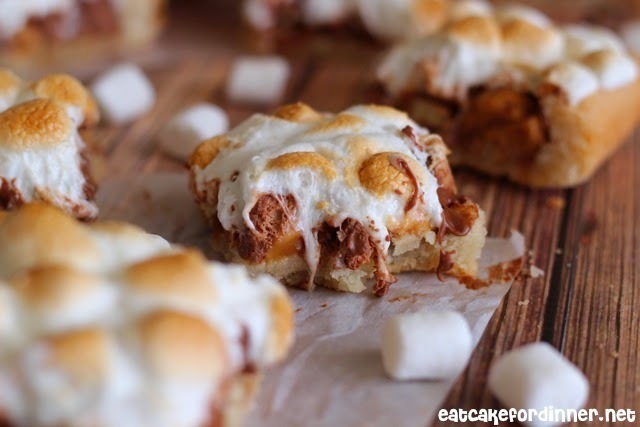 my smores cravings have definitely kicked in, these look amazing! First of all...I LOVE your blog design. It is SO cute. I just followed everything you got. Second, these bars sound amazing! Awww . . . thank you so much for following! !